← Pier Fire Update, 9am, 5/16/17: 75% containment, 32,807 acres. Pier Fire Update, 10am, 9/17/17: 85% contained, 36,556 acres. Fire Summary: Weather was favorable yesterday, supporting the successful firing operation on the ridge above Blue Canyon to the dozer lines east of the 2¼ Road within the Tule River Indian Reservation. The final containment line is now complete between these two points. The majority of active fire will be well within containment lines and residual smoke from this location will be visible to local residents. The escape potential is low, with overall containment at 85 percent. The spot fire on the east side near Pierpoint Springs is still being monitored by firefighters. Ground fuels continue to burn within contingency lines, removing future potential of ignition. A portion of Highway 190 between County Road 208 and Pierpoint Springs remains closed. The incident management team and cooperators are aware that it is a burden to residents and travelers; however, the road will remain closed until safer travel is attainable. The current hazards that keep Highway 190 closed are being evaluated daily. Once hazards within our control are mitigated, the road will be opened. Once it is opened, continue to use caution. Crews continue to identify and cut hazard trees and remove debris from roadways. Firefighters will continue to patrol and mop-up containment lines. Anticipate smoke throughout the interior and perimeter of the fire for an extended period of time due to pockets of unburned vegetation. Backhauling of excess firehose and equipment is being carried out. Fire engines and heavy equipment are large, slow, and often stop in locations unusual to normal traffic flow. Drive with caution. Whenever a fire such as this takes place in a community, there are significant effects. One of those effects is the use of constructed fireline. Constructed fireline is when terrain is scraped down to mineral soil by firefighters using hand tools or bulldozers, making a fire break between burned and unburned fuels. When fire suppression is finished, it the practice of the fire service to repair fireline back to its original state. More than 170 miles of roads and fireline surround the Pier Fire. Fifty of those miles have been repaired. There will be a presence of heavy equipment and trailers around the perimeter of this fire over an extended period as repair work continues. California Interagency Incident Management Team 5, under the command of Mike Minton, would like to thank cooperators and community members for their support throughout the fire-suppression effort. Tomorrow at 6 a.m. the team will transfer command of the Pier Fire to a local Type 3 team from the Sequoia National Forest and the Tule River Indian Reservation. The incident command post will remain at Porterville Fairgrounds. Weather: Mostly sunny with the highs between 75-84 below 3,000 feet and between 65-74 in higher elevations. Minimum relative humidity will be between 25-35% below 3,000 feet and 42-52% above 3,000 feet. Downslope winds will be between 1-4 mph through 8 a.m., becoming upslope/upcanyon at 3-6 mph with gusts up to 12 mph after 12 p.m. Ridgetop winds west to northwest at 3-6 mph. Evacuations: Voluntary evacuations will remain in place for residence in the communities listed below. Returning residents MUST show proof of residency to posted law enforcement to gain access. Examples of accepted documentation are as follows: driver’s license with residency address, utility bill with name and residency address, or PO Box documentation from the U.S. Post Office. The following communities are under voluntary evacuation: Alpine Village, Camp Nelson, Cedar Slope, Doyle Springs, Mountain Aire, Rogers Camp, Pierpoint Springs, Sequoia Crest, and Wishon. Area Closures: Sequoia National Forest trails, roads, and lands around the Pier Fire are closed (Closure Order No. 0513-17-34, https://inciweb.nwcg.gov/incident/article/5548/39662/. CAL FIRE has closed Mountain Home State Forest, and Tulare County has closed Balch Park. All areas are closed until the fire is brought under control. Suppression repair work will take additional time after the fire is contained; recreationalists should plan ahead. Highway 190 is closed to ALL public between County Road 208 and Pierpoint Springs. Highway 190 between Upper Rio Vista Road and County Road 208 is a hard closure for nonresidents and a soft closure for residents with photo ID and proof of residency. Highway 190 between Pierpoint Springs and Ponderosa is a hard closure for nonresidents and a soft closure for residents with photo ID and proof of residency. Primary fuels are dormant brush, hardwood slash, and closed timber litter. The fire is located in a heavy tree mortality area. The southern portion of the fire is burning in a location with little to no recorded fire history. Fire weakened trees influenced by recent fire activity will continue to provide a strong mechanism for rollout. Hold, improve, and mop up completed line. Continue suppression repair and provide structure defense as appropriate. 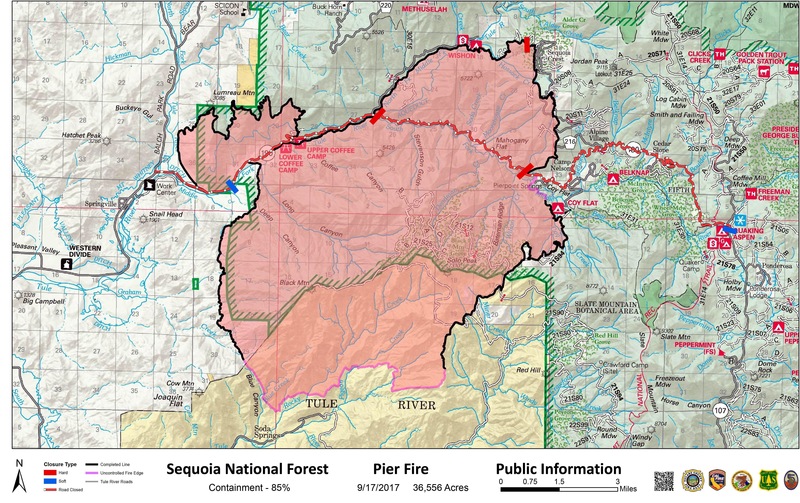 A Type 3 organization from Sequoia NF will assume command of the Pier Fire at 0600 Monday morning – Sept. 18, 2017. The Pier Fire has identified an Initial attack Package to be made available should the need arise. Mostly clear with lows 55-62 in the lower elevations and 45-53 in higher terrain. Maximum relative humidity 60-80%. This entry was posted in fire, Fire Brigade, ponderosa and tagged back burn, black mountain, cal fire, california fire, containment, fire, fire safety, pier fire, ponderosa, smoke, Springville, wild land fire. Bookmark the permalink.